Did you know that the campus we walk on every day used to be farmland? That’s one of the reasons why we live in a county dubbed Orange – it’s for the orange tree groves that used to cover the land here in sunny Southern California. Although the farmland has mostly disappeared and been taken over by apartment buildings, homes and strip malls, Orange County still has strong connections to the agricultural industry that it once thrived on. However, rather than growing produce, Orange County has become somewhat of a farmers market mecca. 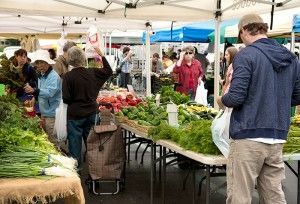 Orange County has over 21 farmers markets and we’re lucky enough to have one right next to us every Saturday morning. Located right across from Campus Drive in the parking lot that would usually be filled with cars parked for Cha and Yogurtland, produce and craft vendors line up their red, blue, green and white tents on a weekly basis to sell everything from pumpkins to headbands for babies to corn on the cob. Although the 8 a.m. wake-up call is probably unprecedented for most college students, especially on a Saturday morning, it’s a lot more fun than going to the grocery store, standing in line with a basket full of groceries and hearing the mundane beep, beep, beep of the barcode scanner. 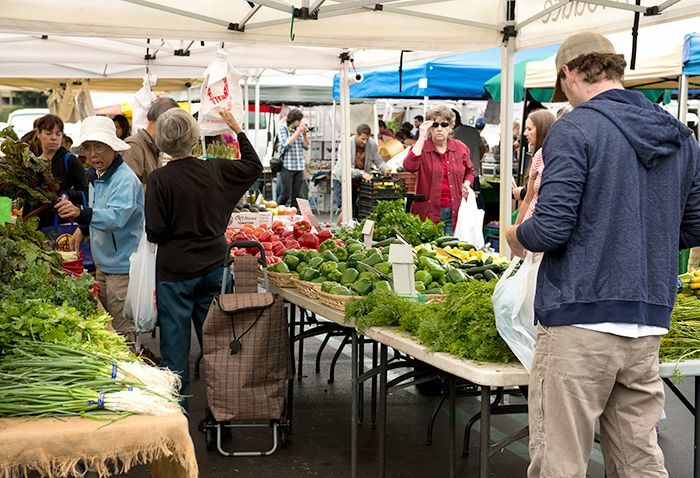 But unfortunately, there are no member rewards cards for those who frequent the farmers market. What are the benefits of shopping at a farmers market? To start, it’s a lot cheaper than shopping at a grocery store. Instead of buying a basket of strawberries for around four dollars at the supermarket, three baskets of strawberries can be purchased for five dollars. As college students who are on a budget, it’s sometimes difficult to shop for healthy food while maintaining a budget. Plus, the produce found at the farmers market is truly fresh. Most of the produce sold at every market is picked that day or the day before. Therefore, everything that’s sold in the market is truly in season, never refrigerated for months on end. Another advantage of shopping at a local farmers market is that it’s local. Farmers markets feature locally grown produce, rarely with farmers coming farther than 100 miles to bring their produce to your local farmers market. The less farmers and vendors have to travel, the less carbon emissions are released into the environment and the less carbon footprint we leave on the planet. Going to the farmers market isn’t a daunting task, but if you’re a first timer, here are some helpful tips on how to make your first few trips to the farmers market more successful. Tip one: Go early! Get to the farmers market when they open, even ten minutes before. Many farmers markets have an opening bell, where they ring a bell that marks the beginning of the selling time for vendors. For some markets, the market coordinators are more strict on allowing vendors to sell before they open, but if you see other customers buying from vendors before the bell, don’t hesitate to start picking out your desired goods. The best stuff goes first. Tip two: Get to know the vendors! How do you usually get to know people? By talking to them of course! By going often and becoming a “regular” with your favorite vendors, it’s likely that they’ll begin to cut you deals and even throw in some free goods! Tip three: Bring a big bag! This is mostly for your own comfort, you don’t want to have plastic bags digging into your arms as you enjoy the fresh air! It’s infinitely easier to throw everything into a big bag and lug it into your car (or bike) later. Although the thought of waking up and dragging yourself out of bed on a Saturday morning doesn’t sound too appealing, just think of the fresh produce you’ll score. Plus, in addition to fresh greens and fruits, one dollar coffee can also be found in the aisles of the Irvine farmers market.